I would like to start this weeks story off with a HUGE thank you to Garrett for getting back to me in such a short notice! We lost contact with one of the drivers from the west coast that we were going to feature this week, we had reached out to Garrett to get him on the schedule anyhow, so thanks for such the quick response we have filled the spot and will not have to change the entire schedule around. Thank you so much for that young sir! With out you guys and even gals this entire series would fall by the way side! Again I ask if you are a driver reading this or a fan and know a driver that would be interested please send us an email to info@theweeklyracer.com and we will work on getting in touch! In the studio this week we have a young driver who has proven to me he like many other young drivers that he has an addiction… an addiction to stock car racing! Along with that addiction is the drive to do what ever he can in his power to fund this addiction. Garrett Marchant is a 17-year-old rising senior from the small town of LaGrange, North Carolina! Growing up Marchant told me he enjoyed playing baseball and was pretty good at it, but from the moment he sat in a race car baseball was put on the back burner! Garrett is actually a third generation driver from the Marchant stables, both father and grand father raced in the past and are still actively involved within the racing community as a matter of fact. Marchant started his journey through the motor sports community in the year of 2010 at the age of 14, one could argue that is a little bit late of a start for kids these days, but one can also argue putting your child in motor sports any earlier is not safe. Good thing that is not my job to decide on any of that! I will stand up and applaud this young man for trying everything in his power to fund his race car! 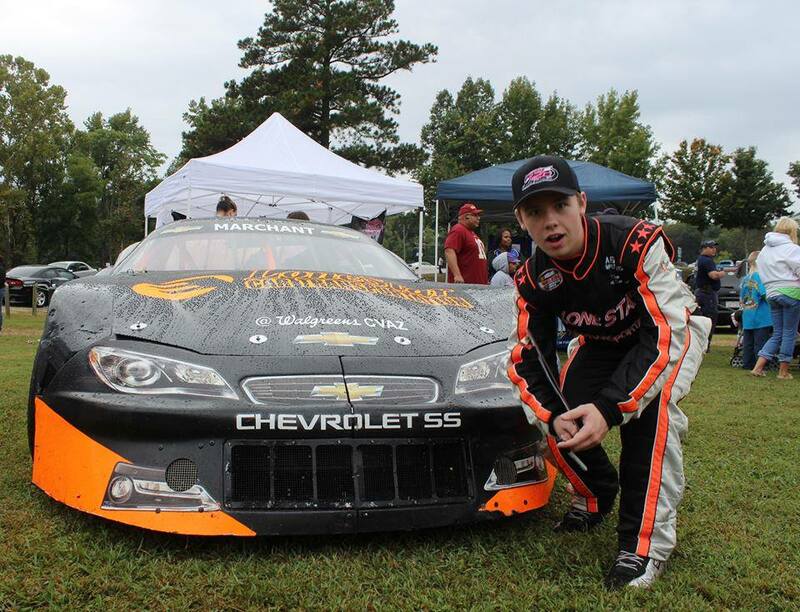 Garrett has created an interesting way for fans and local business a like to help support local racing, a Garrett Motorsports Go Fund Me account (which can be found at this link http://www.gofundme.com/GarrettMarchantRacing) has been set up for any and every to have a chance to get their name on the race car. The cool thing about something like this is the fact it’s very flexible and easy to access, business can donate as often as they want, fans now have a way to get their name on the car and help their favorite driver. By all means if you are a supporter of local short track racing head over to the link and show these guys you like seeing them race, who knows maybe this little trend will catch on! 2014 has the potential to be a pretty big year for this teenager not only racing for the second year in a row for any kind of points, these points he is earning now are not just track points these are NASCAR points! With the restructuring so to speak of the NASCAR Whelen All-American Series points system, drivers like Garrett Marchant now have the ability to win a track championship as well as a National Championship! “I’ve never really raced for points until the SELLM Series last season,” Marchant tells us. “I ended up 5th in the Challenger division standings!” Along with those honors Marchant was voted most popular driver in the 2013 SELLM series, a five race series designed to bring together some of the best LLM guys in the south. Please visit their website for more information; http://www.southeastllm.com/about-the-series.html. Please do not forget to head over and view the rest of our interview with this young man, again just follow the link #77 Garrett Marchant. If you are feeling great and want to help this man achieve his dreams, please feel free to jump over to his go fund me account and show him some support. If you have a special question that you would like to leave Garrett, feel free to do so in the comments bellow and we will get those to him!